While I talked with the legendary roboticist Red Whittaker in his lab at Carnegie Mellon, a half-moon shaped remnant of a Lifesaver was resting on his knee. He nibbled on it as we talked about sending autonomous robots to explore the Moon. That’s when he told me about the Moon caves that could be humanity’s future home. It sounded crazy at first. But the more Red told me about the history of robotics in space, and the promising future of space pioneering, the more I came around. Here was one of the founding fathers of modern robotics telling me we should live in caves on the Moon. 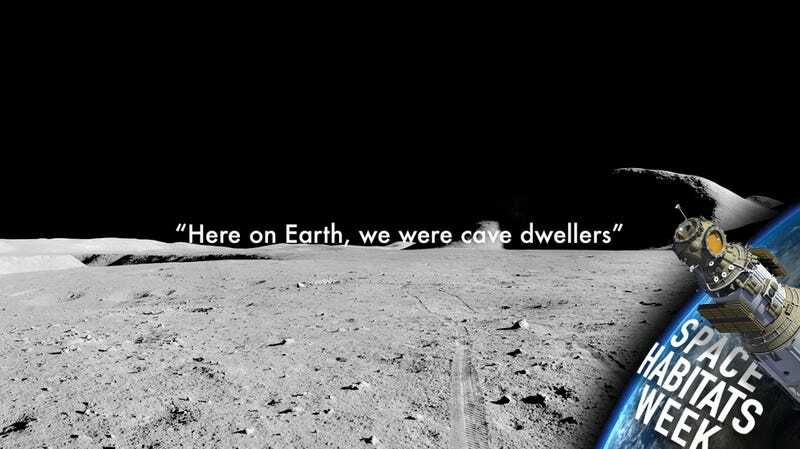 “Here on Earth, we were cave dwellers,” argued Red. So why shouldn’t our futures depend on caves too? I met Red early in the morning, not long after dawn. When he unlocked the door to his lab, we entered a cavern full of some of the most advanced technology I’d ever seen. There was an SUV studded with sensors and covered in decals; it was the first time I’d actually seen a self-driving car up close. We walked past it, then past a rover, and Red found some folding chairs next to a giant pit filled with a greyish dust, like the stuff you see on the Moon. A Businessweek profile from a few years ago says that Red “once wrestled a muzzled chimpanzee on a wager for beer money.” He told the magazine that he decided to build robots because he wanted to do something “in the realm of science fiction.” But there was no roadmap for where robot engineering might take him. So he blazed his own trail. In a sense, we were surrounded by artifacts of Red’s legacy in robotics. We sat in CMU’s Field Robotics Center, which he founded in 1986. Just after Red finished his Ph.D. in 1979, the Three Mile Island nuclear power plant suffered a partial meltdown. With a budget of just $1.5 million, Red and his team built a tethered robot that would later enter the disaster zone and help clean up. Red’s robots would later wander around the ruins of Chernobyl in the 1980s. His team and their robots also searched for meteorites in Antarctica, explored active volcanoes in Alaska, and trekked through the Atacama desert, an environment that resembled the surface of Mars and the Moon. In the 1990s, Red and his colleagues at the Carnegie Mellon Robotics Institute were already perfecting the technology for self-driving cars. They took the first cross country road trip with the cars way back in 1995—with no GPS, by the way. But it wasn’t really until the first DARPA Grand Challenge in 2004 that the technology captured the world’s attention. Red, of course, was there leading a team from Carnegie Mellon. Their self-driving car, Sandstorm, bested every other car in the race by traveling 7.32 miles. The next year at the DARPA grand challenge, Sandstorm lost to Stanford’s team by 11 minutes. That team was led by one of Red’s former proteges, Sebastian Thrun, also formerly at CMU. Thrun went on to become the founder of Google X. But Red didn’t want to rehash old DARPA contests with me. He wanted to talk about humans living in caves on the moon. The roboticist’s current plan is to win Google’s Lunar X prize, for a total of $20 million. To do it, his team will have to send a robot to the Moon, drive at least 500 meters, and beam video of the whole adventure back to Earth. Although people first walked on the Moon nearly half a century ago, we’ve barely begun to explore our closest celestial neighbor. We’ve hardly tapped into the resources that the Moon might offer—namely the treasures that might live in the ice caps on the natural satellite’s poles. NASA’s Lunar Prospector first discovered evidence of water ice on the moon back in 1998, and more recent missions have shown that regolith, or the dust that coats Moon’s surface, could yield oxygen, rocket fuel, and a steady water supply. These resources could, ostensibly, support a human colony on the moon in the not-too-distant future. So why haven’t we done more exploring? Well, that’s complicated. To explore the Moon, we’ll either need to send astronauts or sophisticated (and probably autonomous) robots to go on a series of missions. Crewed missions to the Moon require a lot of resources. That’s part of the reason why humans haven’t landed there since the Apollo 17 mission in 1972. Sending robots to the Moon is a lot cheaper. China plans to land a relatively simple robot on the moon in 2017. The United States plans to land on the Moon in 2018, so that it can install the first node of the so-called International Lunar Network. (The ILN is kind of like an internet on the Moon.) Of course, the general public gets less excited about installing nodes than it does gawking at astronauts bouncing around our only natural satellite. That’s what Google hopes to change with its Lunar X Prize. With any luck, the Lunar X Prize will show how privately-funded space flight can produce real innovation and real scientific research. That’s not quite the same thing as a nation gathered around televisions watching Apollo 11 touch down, but it’s definitely a step in the right direction. When I asked Red to tell me what he was working on, he didn’t point to the nearby rover or even the big pit of moon dust in his lab. Instead, he showed me a picture of a very small but profoundly important feature on the Moon. These pictures of moon few pits were taken by NASA’s Lunar Reconnaissance Orbiter spacecraft. Thing is, as you can see from the photos, right now we can only see down into these moon pits from above. We know they’re there, but we don’t know what’s in there. We can’t go down into them and explore. But scientists believe these pits were created by the underground movement of lava, billions of years ago. If this lava is anything like what we have on Earth, it left long, sinuous tunnels in its wake. This is what Red wants his rovers to confirm. “So they’re sinkholes?” I asked Red, as he was explaining all of this to me. “They are sinkholes!” Red shifted forward in his chair. He pointed to a picture of one unique pit. The so-called Lacus Mortis (pictured in the upper right hand corner of the photo above) has collapsed on one side, leading to a ski slope of a surface. It’s the perfect ramp for a rover to ride down and inspect the walls of the pit—places that were invisible to orbiting cameras. Red’s strategy is working. His company, Astrobiotic, is the only team to win three of the Lunar X Milestone Prizes—one for imaging technology, one for mobility capabilities, and most recently, one for landing technology. Those three wins have netted Astrobiotic a handsome $1,750,000. The company says that all of that money “will further fund lander and rover development.” Astrobiotic has also received NASA funding. The latest rover developed by Red’s team at Carnegie Mellon—a cute little guy named Andy—represents an ambition that’s greater than just building an efficient piece of technology. Red didn’t want to talk about the gadgets. His moonshot is about much more than building a damn robot or a silly rocket. It’s about the future of humanity. Astrobiotic plans to send a rocket to the moon in February 2016. Once it’s in lunar orbit, it’ll float there for four days before sending a lander down to the surface. If all goes as planned, it will accomplish its mission of traveling 500 meters and send proof back down to Earth, back down to Google. But Red’s rover won’t be finished once it’s won the grand prize of $20 million. The rover will rove. It will find its way down into a Moon pit and search for caves. It will explore so that one day, we humans can pioneer. Before I left the lab, I took a picture of Andy, the cute rover. Andy has cameras where eyes might be if it were a living thing. Turning my lens towards Andy’s I thought photographing this little robot might be the closest I ever come to landing on the Moon. I’ll never see the inside of a Moon cave, and I’ll certainly never live there. But this research, these ambitions—they’re not aimed at our lives. They’re aimed at everyone’s. They’re aimed at the future. Correction: An earlier version of this post mistakenly said that the Apollo 17 mission landed on the moon in 1976. It was in 1972.